Occulture The Unseen Forces That Drive Culture Forward By Blondie’s Gary Valentine – Zero Equals Two! “Art, magic, and the occult have been intimately linked since our prehistoric ancestors created the first cave paintings some 50,000 years ago. As civilizations developed, these esoteric forces continued to drive culture forward, both visibly and behind the scenes, from the Hermetic ideas of the Renaissance, to the ethereal worlds of 19th century Symbolism, to the occult interests of the Surrealists. 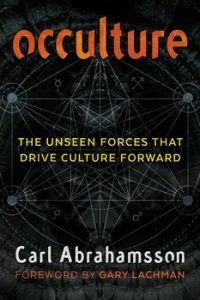 “In this deep exploration of ‘occulture’–the liminal space where art and magic meet–Carl Abrahamsson reveals the integral role played by magic and occultism in the development of culture throughout history as well as their relevance to the continuing survival of art and creativity. Blending magical history and esoteric philosophy with his more than 30 years’ experience in occult movements, Abrahamsson looks at the phenomena and people who have been seminal in modern esoteric developments, including Carl Jung, Anton LaVey, Paul Bowles, Aleister Crowley, and Rudolf Steiner. “Showing how art and magic were initially one and the same, the author explores the history of magic as a source of genuine counter culture and compares it with our contemporary soulless, digital monoculture. He reveals how the magic of art can be restored if art is employed as a means rather than an end–if it is intense, emotional, violent, and expressive–and offers strategies for creating freely, magically, even spontaneously, with intent unfettered by the whims of trends, a creative practice akin to chaos magick that assists both creators and spectators to live with meaning. He also looks at intuition and creativity as the cornerstones of genuine individuation, explaining how insights and illuminations seldom come in collective forms.